Domain and co-domain – if f is a function from set A to set B, then A is called Domain and B is called co-domain. Range – Range of f is the set of all images of elements of A. Basically Range is subset of co- domain. Image and Pre-Image – b is the image of a and a is the pre-image of b if f(a) = b. Equality: Two functions are equal only when they have same domain, same co-domain and same mapping elements from domain to co-domain. 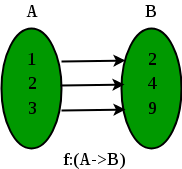 One to one function(Injective): A function is called one to one if for all elements a and b in A, if f(a) = f(b),then it must be the case that a = b. It never maps distinct elements of its domain to the same element of its co-domain. We can express that f is one-to-one using quantifiers as or equivalently , where the universe of discourse is the domain of the function. Onto Function (surjective): If every element b in B has a corresponding element a in A such that f(a) = b. It is not required that a is unique; The function f may map one or more elements of A to the same element of B. One to one correspondence function(Bijective/Invertible): A function is Bijective function if it is both one to one and onto function. Inverse Functions:Bijection function are also known as invertible function because they have inverse function property. The inverse of bijection f is denoted as f-1. It is a function which assigns to b, a unique element a such that f(a) = b. hence f-1 (b) = a. Strictly Increasing and Strictly decreasing functions: A function f is strictly increasing if f(x) > f(y) when x>y. A function f is strictly decreasing if f(x) < f(y) when x<y. Increasing and decreasing functions: A function f is increasing if f(x) ≥ f(y) when x>y. A function f is decreasing if f(x) ≤ f(y) when x<y. 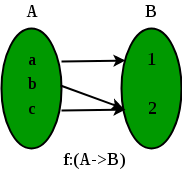 Function Composition: let g be a function from B to C and f be a function from A to B, the composition of f and g, which is denoted as fog(a)= f(g(a)). f-1 of = f-1 (f(a)) = f-1(b) = a.
fof-1 = f(f-1 (b)) = f(a) = b. If f and g both are one to one function, then fog is also one to one. If f and g both are onto function, then fog is also onto. If f and fog both are one to one function, then g is also one to one. If f and fog are onto, then it is not necessary that g is also onto. A function is one to one if it is either strictly increasing or strictly decreasing. one to one function never assigns the same value to two different domain elements. For onto function, range and co-domain are equal. If a function f is not bijective, inverse function of f cannot be defined.